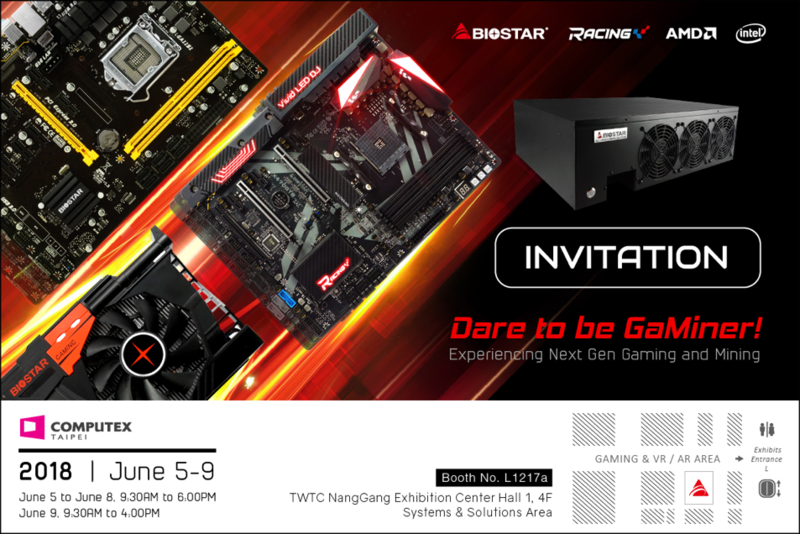 May 29, 2018, Taipei, Taiwan â€“ BIOSTAR is excited to bring its latest gaming, crypto mining, smart home, and IPC solutions to COMPUTEX 2018. This includes the latest flagship 3rd generation RACING series featuring the Intel 300 chipset motherboards for the 8th generation Coffee Lake processors and AMD AM4 X470 platform. BIOSTAR will also have their newest crypto mining and blockchain solutions with the popular Intel 300-series BTC-line motherboards and prebuilt iMiner rigs. 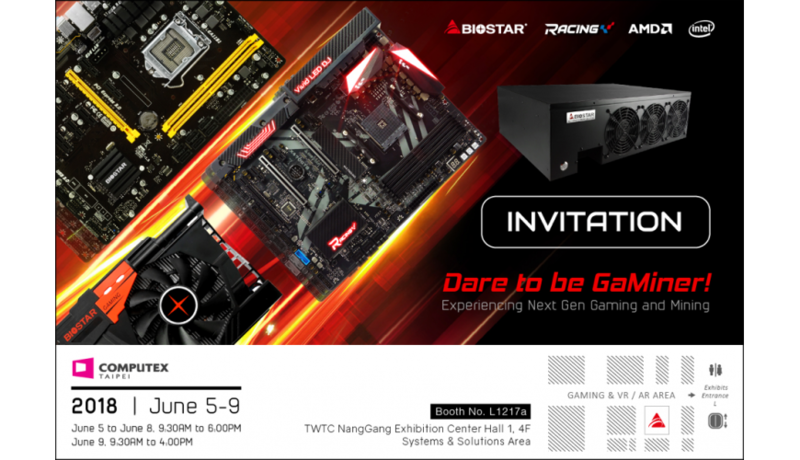 In addition, visitors will be able to find BIOSTAR's graphics cards, NVMe SSD solutions, along with its smart home, and industrial PC solutions. BIOSTARâ€™s popular gaming motherboards are known for hitting the price-performance sweet spot, which now features the 3rd generation RACING series. During COMPUTEX, visitors will see these sporting the latest Intel 300-series chipset with the premium black RACING design. 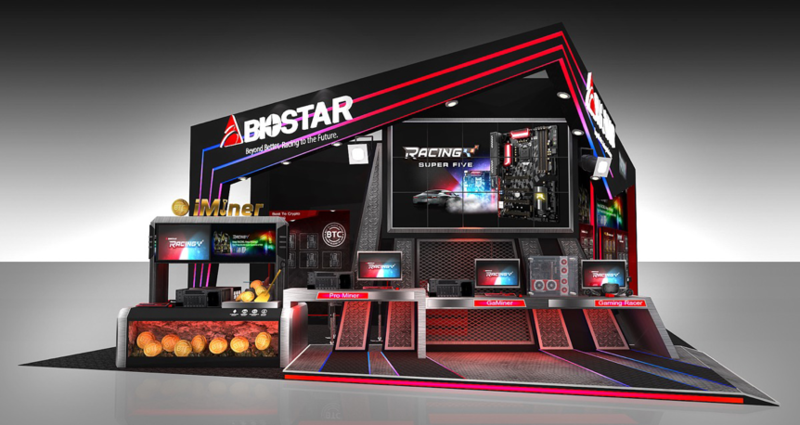 BIOSTAR will also have a separate experience zone for visitors to try out the RACING series in VR using the latest AMD AM4 X470 platform. Other canâ€™t miss products includes a smart home solution to have your home well connected with the latest tech in this digital age. The powerful and versatile IPC solutions that BIOSTAR provides for various industries. And a brand new introduction to BIOSTARâ€™s entry into the high-speed M.2 SSD and gaming graphics cards. We look forward to seeing you at COMPUTEX 2018, Taipei Nangang Exhibition Center, Hall 1, 4F Booth L1217a from June 5th â€“ June 9th 2018.